This past weekend’s Belgianfest held in Georgetown turned out to be a showcase of skill for many of our beloved local brewers. While some of the attending breweries regularly produce Belgian-style beer, there were several breweries pouring their first commercially produced attempts at the style. To say there was an impressive lineup of beer on hand would be an understatement. 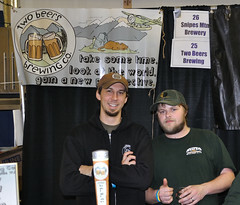 There were 26 Washington breweries with booths, and many of them were pouring 2 or more beers. My only negative thought about this festival was that I wasn’t able to try everything, and I’m sure I missed out on several gems. Snipes Dark Matter Blended Sour Red – Head Brewer Chris Miller took a 2 year old Belgian strong ale aged in a bourbon barrel then blended it with a sour brown ale fermented with 2 strains of local Brettanomyces and lacto fermented in a Bordeaux barrel with 60 lbs of Montmorency tart cherries added throughout fermentation. The result was a phenomenal dark sour with a very complex flavor profile. This was the only beer I had to have a second serving of. One of the most amazing things was that Chris mentioned that he has very little experience with sours, and that he’s really just learning as he goes along. Color me impressed. Black Raven Pour les Oiseaux Wine Barrel Aged Saison – I remembered this one from the Big Wood Festival at Brouwer’s, but I still had to have a sample of it. I love the combo of spicy saison and the oak and fruity/citrus wine barrel notes. Georgetown Donkey Deux – I had to do a double take when I saw large 750ml bottles (sorry my pic is blurry…) sitting out on the table at the Georgetown booth. This usually draft-only brewery decided to craft a bottle-conditioned dubbel for the festival, and it was impressive for what I believe is their first commercial attempt at a Belgian-style beer. I love it when these guys break out something special for us to enjoy; there is no doubting their brewing skill. Fremont Sideshow Saison – Fremont brought two different saisons to serve, and this was the funky one fermented with Brett. It was well executed and a nice surprise. I’m really enjoying the beers I’ve been having from Fremont, and I need to make it by their “urban beer garden” sometime soon. Anacortes Sour Brown Ale – The Anacortes Belgian Trippel was aged for 51 weeks in a Merlot barrel with Brett to create this impressive sour ale. RAM Northgate BBLage-a-trois – “A risque blend of 3 wildly fermented barrels infected with bugs and critters the brewers themselves can’t quite recall.” This was another nice funky sour ale to throw in with the others. I didn’t notice it last night, but the name sounds like a take on one of my favorite bands: Garage-a-trois. Rogue Issaquah Polywog Grand Cru – This one wins for most unique beer of the festival. This very strong Belgian ale had bing cheery juice added during fermentation, and it was then aged in Pinot wine barrels that had Rogue’s Pink Gin aged in it. The resulting beer was complex, sweet, and picked up a lot of the gin flavor. It was listed at 11% ABV, but it turns out it might have actually been closer to 15% ABV. Definitely a sipper, but one that should be limited to one sample per person at a fest like this. Hale’s “25” Belgian Dubbel aged in bourbon barrels – I’m a fan of the regular “25”, and this bourbon barrel version was even better. Just enough bourbon was picked up in the base beer. Nicely done by Hale’s. There were quite a few beers pouring that I have enjoyed in the past and therefore spent my tokens on other things new to me. Big Time Malaprop 8, Pike Tripel Kreik, Elysian/Green Flash Red Queen, and Snoqualmie Spring Fever were just a few of them. In addition to those, there are plenty of others I really wish I could go back and try this week! Another welcome inclusion at the festival was ice cream from Bluebird and Belgian waffles from Sweet Iron Waffles. Jeanne had a waffle with chocolate to go along with a cup of Elysian Bete Noel ice cream, and the combo was decadent. Jeanne and I were already very familiar with the goodness of Bluebird, but we’ll have to add Sweet Iron to our list of guilty pleasures. There was also a sausage vendor outside the fest that sounded great, but we didn’t partake (we held out for late-night Kau Kau after the fest). The event was well-organized, amply staffed, not over-sold, and just a great time overall. It sounds like there were some serious bathroom issues during the first session, but they remedied that by bringing in four or five porta-pots for the second session that we attended. Both sessions sold out easily, and I heard talk of possibly moving the fest to a larger venue at Seattle Center for next year. One thing to note is that people shouldn’t be allowed to drive to a festival like this and then drink their full 10 tokens. I know there is no way for the organizers to regulate it, but with the many high ABV beers at the fest I get the feeling some people were driving that probably shouldn’t have been. Cabs and buses are your friends, people. Cheers to the Washington Beer Commission and all the Washington brewers that put together such a great event! I’ll have a review of the Belgianfest beer dinner at Corson Building from Friday up either tomorrow or Wednesday. 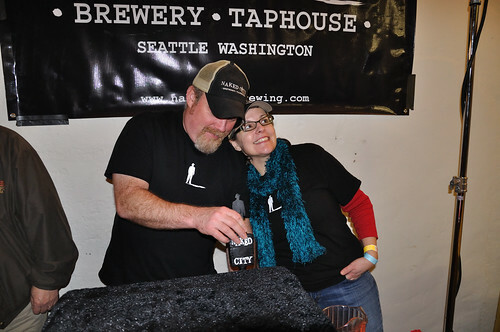 Don & Janet Webb pouring at the Naked City Brewery booth. I attended the early session of Belgianfest and was equally impressed with the event. I have to agree that the 4-hour timeframe really limits your options for sampling the beers. Especially if you want to spend any time considering each sample, which I did. I took the full 4 hours to go through my ten tokens, and by the end of it I was very happy I had arranged a ride. This was an outstanding event to be sure, it will rapidly outgrow The Engine Room and has already outgrown a 4-hour tasting session. The glassware provided was indicative of the complexity and quality of beers offered, and is certainly my favorite beer festival taster thus far.